Special zones are designed to boost or reform economies, but could also help encourage stability. Over the last year Japan and China have begun to debate and set up new versions of geographical areas designed to stimulate foreign investment and either revitalize or introduce significant sectors to their respective economies. While their challenges are different, the goals are very similar: each is seeking a new path in the 21st century to sustain and build upon the world’s second and third largest economies. Japan’s National Strategic Special Zones are part of the “Japan Revitalization Strategy,” or the third arrow of Abenomics. Japan is targeting the area north of Tokyo, the Kansai region encompassing Osaka, Kyoto and Hyogo, as well as four other areas including Niigata, Fukuoka and Okinawa. Drug development and innovation in health and medical care are being targeted. Agriculture is also seen as another field in need of reform. Regulatory reform is a keyword that the Abe government is seeking to attach to this strategy. The aim is to make Japan’s stagnant economy competitive again internationally. The goal is for the national government, local government, and private businesses to collaborate on the specifics of the plan for each of the six regions designated. According to the Financial Times, “Each zone will be allowed to loosen regulations in a particular industry or economic sector… subject [to] negotiations with Tokyo.“ Many of the suggested reforms, like the reconsideration of agricultural commissions to unfetter this long stagnating industry, have been debated and decided on by the Cabinet, but with no subsequent action. In fact there has been little of substance announced by the government beyond its initial statements in late March. Prime Minister Shinzo Abe is expected to provide more details by June. The initiative is led by the National Strategic Special Zone Advisory Council, which is chaired by Abe and comprises cabinet members together with experts in those parts of the economy to be affected. The biggest changes are expected to come in Fukuoka and Tokyo, where employment regulations and regulatory reforms are respectively on the menu. It is clear that the strategy is to revive existing commercial and technological hubs instead of identifying and developing new growth regions. The government is clearly identifying areas it believes will remain dynamic over the long term, despite the looming prospect of population decline. According to Forbes, the zones will allow foreign doctors to practice, but only on foreign patients, and will allow for the use of currently unapproved drugs. Education will also see some change with greater employment of foreign teachers and foreign schools will be able to utilize public facilities, again within the zones. Foreigners may also be given a special visa status to start new businesses within the zones. The biggest change may be to labor laws, allowing companies an out from being obliged to honor lifetime employment guarantees for employees. In theory this would make the labor market more flexible and permit companies to scale their workforces to fit company goals. While this is a common practice in the West (particularly the U.S.), it is a novelty in Japan and viewed with nervous suspicion by Japanese labor. 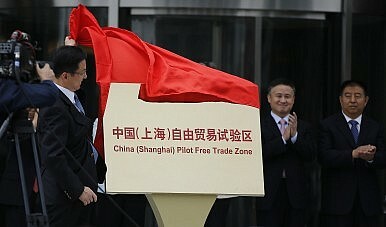 While the Japanese special zones are really just a new and more top down approach to an old theme, the Shanghai Pilot Free-Trade Zone is a first for China’s communist government. Officially opened in September 2013, it encompasses four special trade zones in Shanghai covering 29 square kilometers. Its intent is to act as a laboratory for financial experiments. If it proves successful the idea could be implemented elsewhere in the country, possibly in other cities that comprised China’s hugely successful Special Economic Zones. One of the biggest features of the new zone will be a liberalized foreign currency exchange and an attempt at market-determined exchange rates. Citibank officially opened a branch in the zone on March 12, and China’s “big four” banks are all expected to follow suit. China is looking for a place to become a major financial center to facilitate its change from an export-driven economy to a consumer-based economy. China is also taking a new approach on foreign investment, opening investment in all sectors unless specifically restricted as part of a “negative list.” Companies will only have to file records with authorities rather than go through the lengthy approval process traditionally required. The government has however maintained tight control over cultural and entertainment sectors, and the telecom industry (particularly internet access) is being closely monitored. The monetary requirements for incorporation have been lowered and the process has been streamlined under a single agency, the Industry and Commerce Authority. Additionally, the “negative list” of sectors off limits to foreign investors is expected to shrink from 190 to 130 this year, according to the director of the fiscal and financial section of the FTZ management commission. The different approaches taken by Japan and China to revitalize and reorient their economies invite comparison. The Japanese model is geared more toward developing domestic industry and identifying key new areas where liberalization would have the greatest effect. The Chinese model is focused on experimenting with true economic liberalization, within a space small enough for the Chinese government to contain the effects should they prove to be a negative in the eyes of the Chinese Communist Party. For Japan, the greatest change will come when and if Japanese companies are able to exercise greater control over their workforces. Being able to rapidly scale labor to fit demand and innovation in new industries would be a boon, and might give Japanese companies the agility to become more competitive. The risk is what the disruption in the labor market would do to a country so attached to near full employment. In China, opening new sectors to foreign investment and liberalizing exchange rates has the potential to drastically increase the size of China’s financial services sector. China is being very careful in this regard, which is why the size of the Free Trade Zone and the parameters of the “negative” list have been given so much attention. As China and Japan introduce these new economic initiatives, they would both benefit from a reduction in regional tensions, which would reduce distractions and the potential for misstep. Economic prosperity remains an incentive for peace, and domestic populations with disposable income and rising standards of living are less inclined to see those things jeopardized.